UNITED NATIONS — U.S. Ambassador to the United Nations Nikki Haley secured another significant win at the Security Council Wednesday when a resolution renewing the mandate of the UN’s peacekeeping mission included tougher language on tackling Hezbollah — a resolution that was also celebrated by Israel. “The status quo for UNIFIL was not acceptable and we did not accept it,” said a triumphant Haley after the resolution was accepted by the UN Security Council anonymously. The negotiations over the renewal of the UN Interim Force in Lebanon’s (UNIFIL) mandate centered on Hezbollah — the Iran-backed terrorist group which the U.S. and Israel have accused of stockpiling weapons in southern Lebanon near the country’s border with Israel. 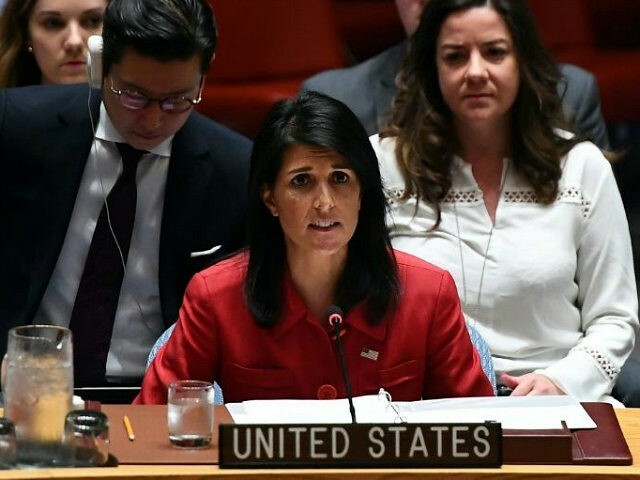 Haley had blasted the UN for not dealing with, or even naming, the Hezbollah threat and called for a tougher mandate that would focus on the group. Israel and the U.S. have repeatedly criticized the U.N. for “obsessing” over Israel while ignoring Iran and Hezbollah. The resolution, drafted by the French, appears to have been amended with significant changes after negotiation with the U.S. Particularly, UNIFIL is now required to give more detailed reports about when and where UNIFIL has its freedom to move and investigate hindered. For the United States, this is a time for strength, resolve and accountability at the United Nations. Our actions today go to the heart of this new approach. The United States will not sit by and watch Hezbollah strengthen itself for the next war. We will not be passive as Iran makes a mockery of this Council’s word. Today we took a very good step forward. Together, our next job is to make sure UNIFIL does what we have instructed it to do here today. This is a significant diplomatic achievement that could change the situation in southern Lebanon and expose the terror infrastructure that Hezbollah set up on the border with Israel. The resolution requires UNIFIL to open its eyes, and forces it to act against Hezbollah’s terror buildup in the area. We will continue the fight against Hezbollah and ensure that UNIFIL fulfills its duties on the ground. The move marks the latest victory for Haley at the UN. In March, Haley forced the withdrawal of a report that called Israel an “apartheid” state. This month Haley’s team was able to convince China and Russia to sign on to a resolution imposing significant sanctions on North Korean exports — a feat that had seemed unlikely just days before.